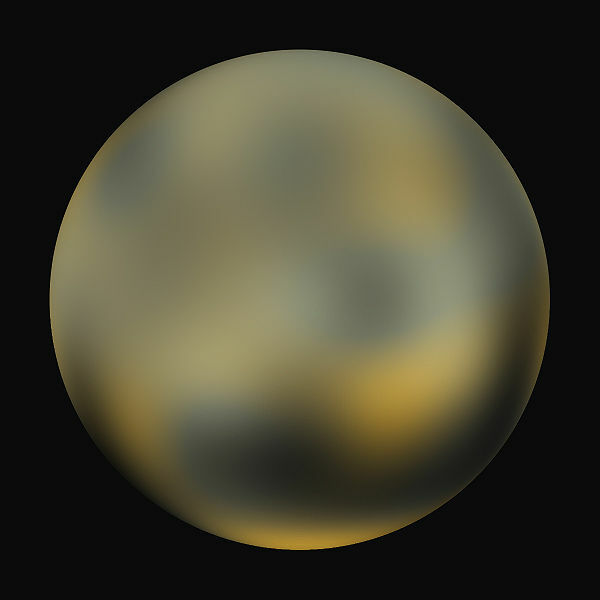 Pluto, a dwarf planet, as imaged by the Hubble Space Telescope. Expect better pictures next year. What is a dwarf planet? Under the definition accepted by the International Astronomical Union (IAU), a dwarf planet is any object orbiting the Sun that is large enough to become round under its own gravity, but is not large enough to have “cleared the neighborhood around its orbit” by its gravitational influence. A planet is an object that is round and has “cleared its neighborhood”. You may remember when these definitions were accepted by the IAU back in 2006, resulting in Pluto being reclassified from a planet to a dwarf planet. The actual definition of the word “planet” is a can of worms that I will save for another time. For now, I will note only that I feel that the “clearing the neighborhood” business is scientifically sloppy, and there are better and more quantitative ways to measure the same thing. What I want to discuss today is, at first glance, a simpler question: How many dwarf planets are there? The answer turns out to be that we don’t know, even about the ones we’ve discovered. After all, how big does an object have to be to be round? We’re not sure, but we think the answer is about 300 kilometers. However, it might change based on how much rock is in an object, and we can’t measure it very accurately at the large distances where we find them, near Pluto or even beyond. We can get a rough estimate, though we’ve discovered well over 100 objects larger than 300 kilometers in the outer reaches of the Solar System. Like it or not, you’re not going to be reciting them all in elementary school. But there’s a problem. The IAU gives a different answer to this question. They are the ones who make it all official, and they say that the number of dwarf planets is 5. All of the others are just possible dwarf planets. We can’t measure the actual sizes of things in the outer Solar System very well, and we certainly can’t measure roundness very well, so we really have to go based on brightness. But the IAU wants to be extra-extra-sure that an object is big enough to be round before they officially call it a dwarf planet. Because of this, they only call things dwarf planets that have an absolute magnitude of H < +1. An object this bright cannot possibly be smaller than 838 kilometers. In other words, without pictures to prove that they’re round–pictures that won’t be possible until at least 2018 when the next generation of telescopes start to come online–the IAU will not consider an object to be a dwarf planet unless it is much larger than is necessary. Sadly, this leaves a lot of interesting objects like Sedna out in the cold–no pun intended. Now, in some respect, this doesn’t matter. Scientists can do their own thing. Science is peer reviewed. If Mike Brown wants to call Sedna a dwarf planet, even in a formal publication, he’s free to do so as long as the other scientists agree with it. The problem with this (or maybe not a problem if you’re a fan of Pluto) is that this leaves the IAU behind. The IAU’s very conservative action on this issue causes its classification not to be followed as carefully and undermines the whole (admittedly questionable) idea of writing a definition in the first place. Not to mention the fact that the IAU never even tried to classify exoplanets. I’m still waiting on them every three years to take that one up at their general assembly. The next one is in 2015, but I’m not holding my breath. Disclosure: While I am an astrophysicist, I am not a member of the IAU. This entry was posted in Planets, Space and tagged dwarf planet, iau, pluto. Bookmark the permalink. I’ve always wondered what happened to Pluto. Thanks for the clarifications.